Designer Florence Broadhurst’s life is a vortex of controversy, starting with the premise that she may not even have been a designer at all. It is well known that she had poor eyesight and that she hired out artists to draw all of the wallpaper designs issued in her name. The following photos with her drawing at a light-box and with an easel in her hand were staged for the press. Plus she regularly fibbed about her past, including the most simple of facts: where and when she was born. Florence claimed to be 48 when she was in her 70s and that she was from England, not Australia. At one point in her life she was known under an entirely different name, Madame Pellier. Additionally, although she never married Leonard Lloyd Lewis, she called herself “Mrs. Lewis,” and she never told her son Robert Lewis that she was not married to his father. Robert only learned that tidbit on his father’s death in 1989 (Florence died in 1977). Even her death is controversial. Florence Broadhurst died violently in the hands of an unknown murderer. Yet, despite her contentious past, there is no doubt that the designs issued in Florence Broadhurst’s name continue to resonate with the public for their beautiful colors and timeless beauty. Signature Prints, the company that owns the Broadhurst archive, is painstakingly restoring all of the artwork. Top designers are using her (generally quite expensive) wallpapers and fabrics. The designs have been interpreted as rugs by the company, Knots. And most recently Kate Spade has partnered with Signature Prints to reissue her Japanese Floral pattern (first photo above) as fashion and home accessories. So Florence Broadhurst lied. A lot. But if one looks carefully at her past and even her preferences for dress, it is easy to see that she was the mastermind behind her designs, even if she didn’t draw a single one herself. There are lots of chinoiserie influenced pattern, bold scale and bright color that speaks directly from her over-sized life and personality. For example, as a young woman, Florence was part of musical troupe that toured throughout Asia and India. Check her out in the following picture. Florence is reclining on a tiger skin in India. 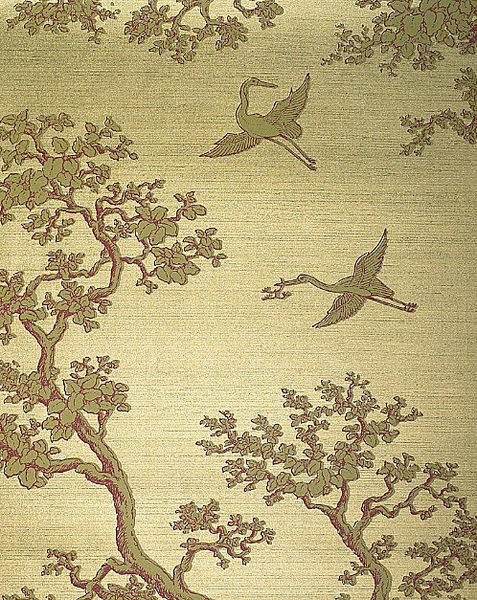 It is easy to see the parallel between her wallpaper Cranes and the outfit with its embroidered cranes, that she has on. Also there is little surprise to learn that she developed a tiger stripe pattern in her animal print series. 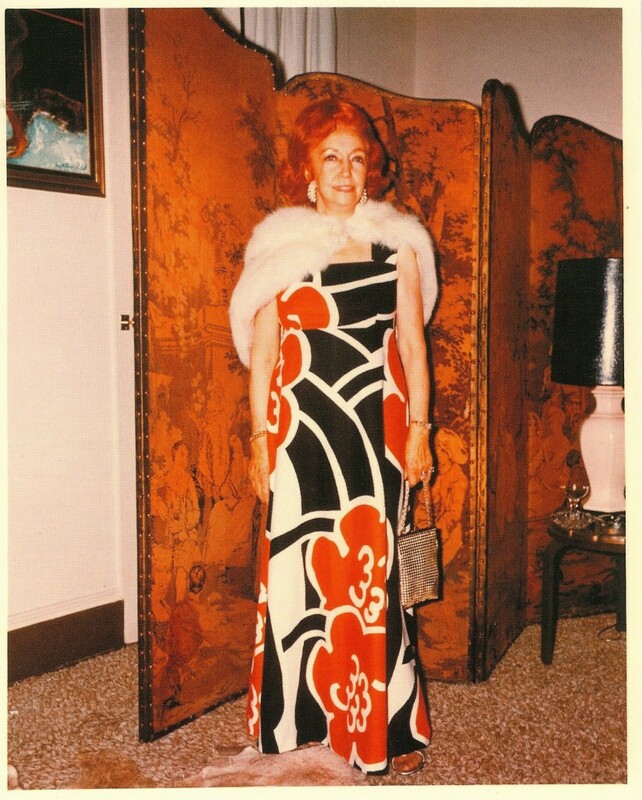 Photos of her later in life clearly show her predilection for bright colors and bold scale. Just look at what she is wearing. Her son Robert claims that she demanded vibrant palettes from her artists because she could see bright colors better. Why she choose bright colors doesn’t really matter in the end. She in fact did choose them—there is a direct relation between her past, her wardrobe and her designs. Respected artist and mother of one of Florence’s employees, Dawn Fitzpatrick, explained it this way: Florence “didn’t have the ability to do what she wanted to do, but she knew what she wanted. She was quite a brilliant woman.” Fitzpatrick added that Broadhurst had a wonderful eye for people. * Essentially, she hired and managed great staff to help her execute her vision. All would have been lost but for the efforts of Helen and David Lennie of Signature Prints. How they came to control the archive is a mix of corporate intrigue and luck. Good fortune for us all actually. What a tragedy it would have been to lose the work of Florence Broadhurst. *Dawn Fitzpatrick’s quote (which appears on pages 216-217 of the first edition), and much of the information and photos from this post, come from the book by Helen O’Neill entitled Florence Broadhurst: Her Secret and Extraordinary Lives. **Naylor’s quote appears on page 172 of the 1st edition of the book. Read the book, if you want to learn more about Florence Broadhurst’s incredible life. It also is a wonderful catalog of her designs.